Payal and Vince's wedding took place over 3 days in San Miguel de Allende, Mexico over Thanksgiving weekend. 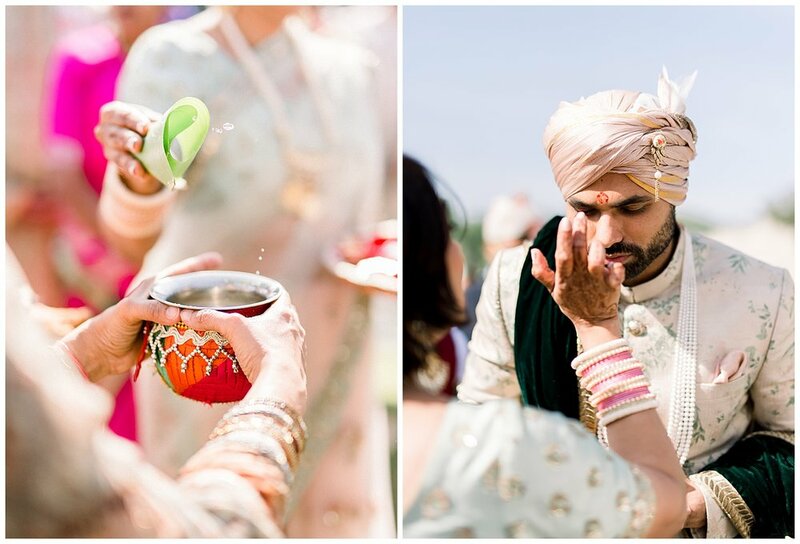 When it came to planning their wedding, they were set on putting their own spin on tradition and opted for a fusion of cultures and blending of traditions, integrating their Indian Heritage and American lifestyle with Mexican wedding customs. On their wedding day, they wore two separate custom outfits. 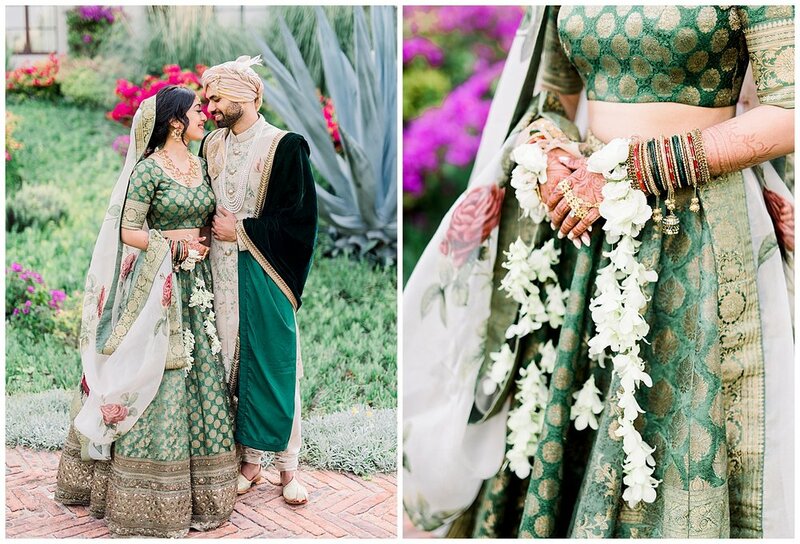 Instead of wearing the traditional red to her ceremony, Payal chose to wear green in a custom lehenga by Sabya Sachi, designed and made in India. Her veil had large red roses that perfectly complimented the green. 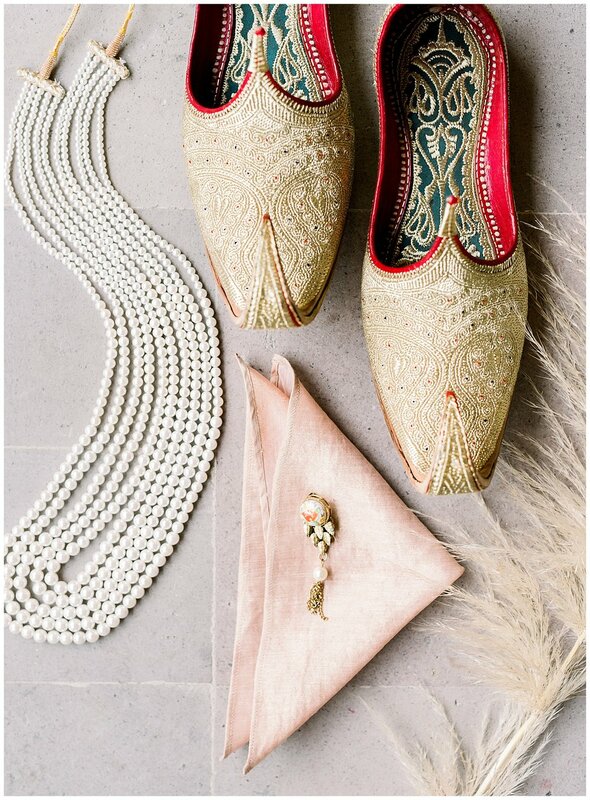 Vince wore a hand-printed sherwani with custom made gold shoes and a necklace adorned with hundreds of pearls. 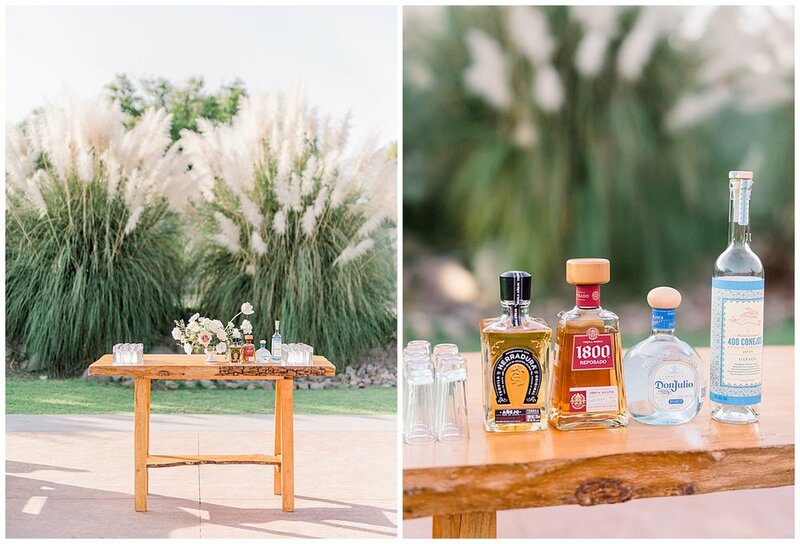 The wedding venue, Rosewood San Miguel de Allende, naturally grows Pampas grass all around the property, so it was also used to decorate the ceremony and reception space. As with a typical Indian wedding day, the events were split up between morning and night. Their ceremony took place at 10:00am. Leading up to it was the Baarat, where Vince traveled to the ceremony site on a white horse. Guests danced to the beat of the Dhol (drum) and were led from the Baarat to their seats by the Dhol performer. 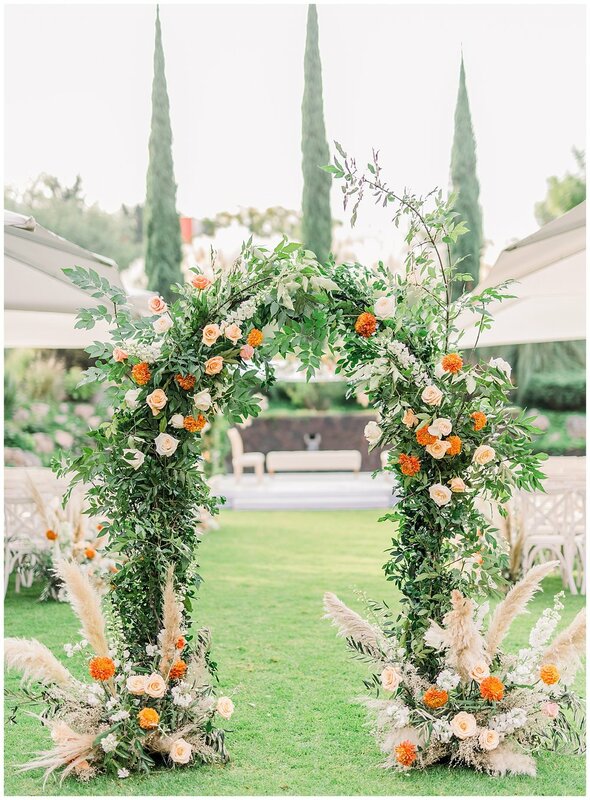 At the ceremony, the Mandap was decorated with bright roses, orange mums, pampas grass, and Mexican tin stars. The bridesmaids (and bridesman!) wore shades of mauve that were a perfect compliment to the warm tones of the hotel. The deeper tones perfectly matched the mauve roses in Payal's bouquet. During the cocktail hour, guests were offered a choice between 4 types of Tequila at the Tequila Shot bar. Guests mingled on the patio in front of the tent, sporting their own outfit changes. The cocktail hour had a lounge area for seating and Mexican inspired hors d'oeuvres, such as mini tacos to go with the tequila. For the reception, Vince and Payal changed into their second outfit. He wore a velvet tuxedo and she wore a beautiful red outfit with detailed beading throughout. 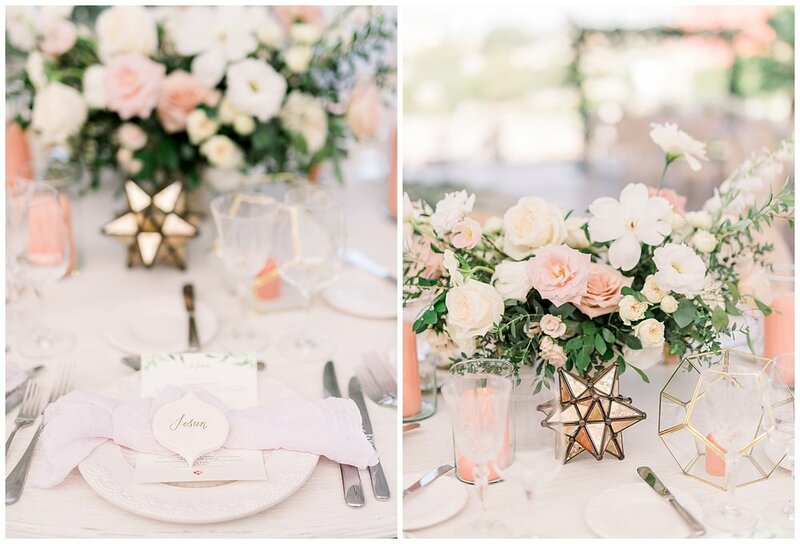 Hundreds of Mexican tin stars were hung from the 40-foot tent which gave the reception an elevated yet whimsical feel. 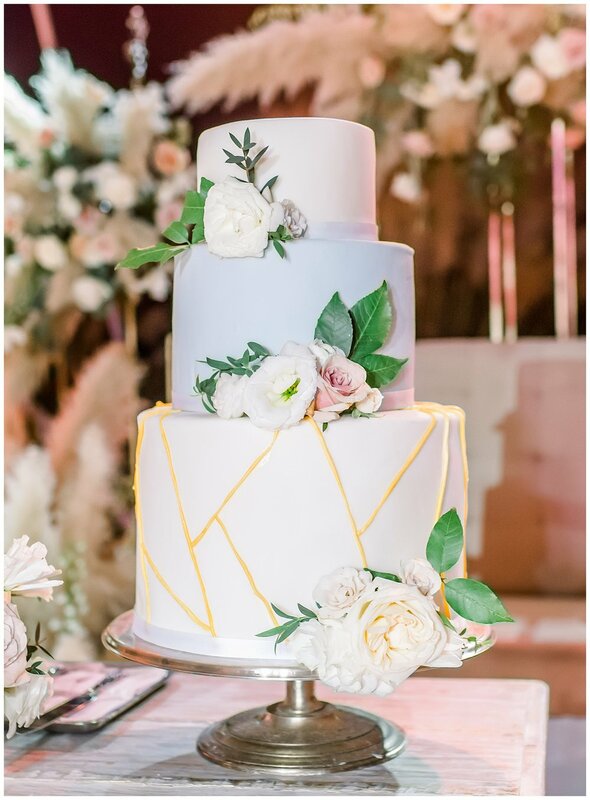 The centerpiece of the reception was a fountain made of hundreds of roses and pampas grass. Each guests' plate featured a custom hand-painted tile with their name on it. Off in the distance, the guests had a perfect view of the Parroquia de San Miguel Arcángel. 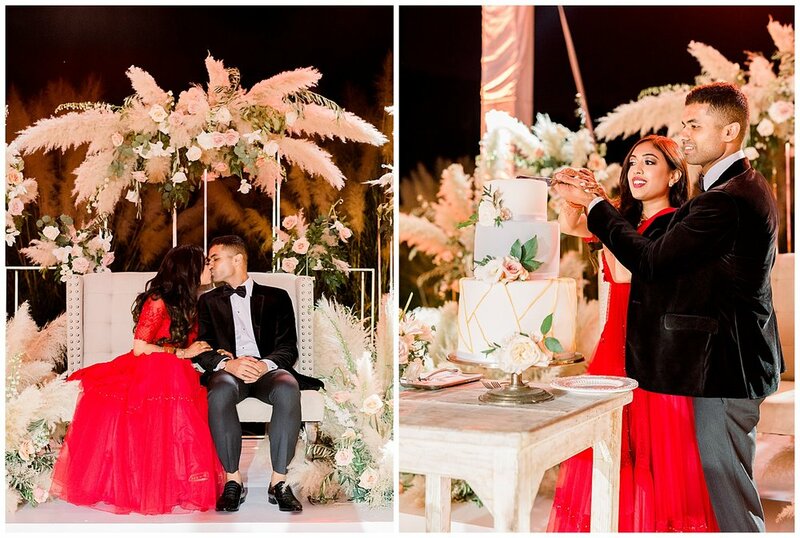 Payal and Vince entered their reception with fireworks - a special touch that set the tone for the fun events ahead. 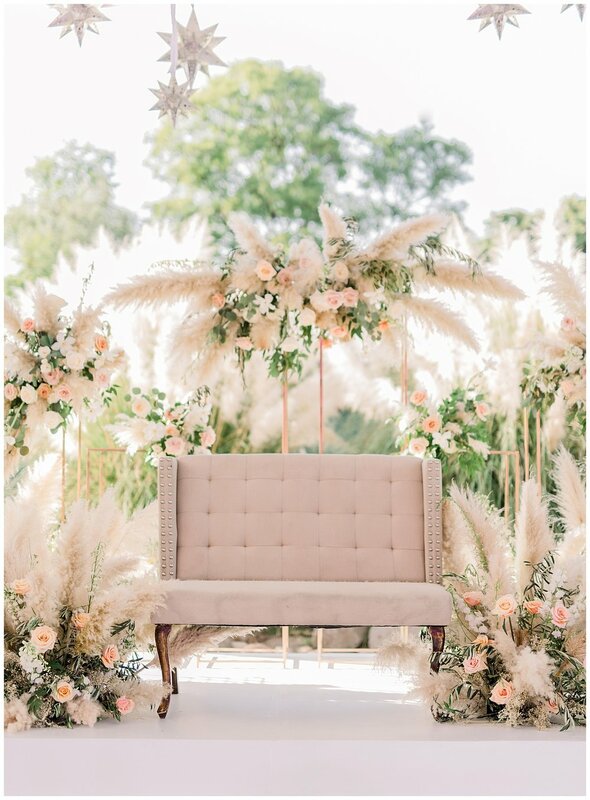 Throughout the evening, they sat on a throne surrounded by arrangements of roses that appeared to be bursting with pampas grass (a nod to the fireworks during their Grand Entrance). From here on out, they enjoyed performances by many guests, including younger cousins and other family members. Their first dance was a medley of the Narcos theme song and Nat King Cole's "Love". They took 7 dances lessons and performed it perfectly.